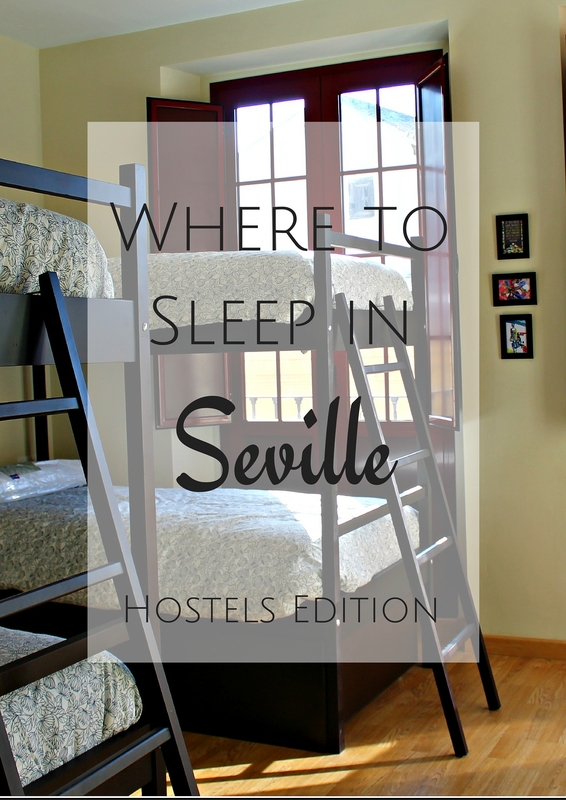 One of the questions I’m most often asked about traveling to Seville is where to sleep. I’ve slept in my own house or a friend’s (or the Novio’s) since arriving and can only recall a night in a creepy hostel, so it’s not the easiest question to answer! On my first trip to Seville over a decade ago, the only spaces available for budget travelers were seedy hostels with questionable security and run-down pensiones. Ten years on, tourist apartments and AirBnB digs are often preferred accommodation choices in Spain, but who can resist a good hostel? When traveling alone, I tend to stick to dorm room digs where I can meet other backpackers, mostly because I love the sort of camraderie a hostel breeds. 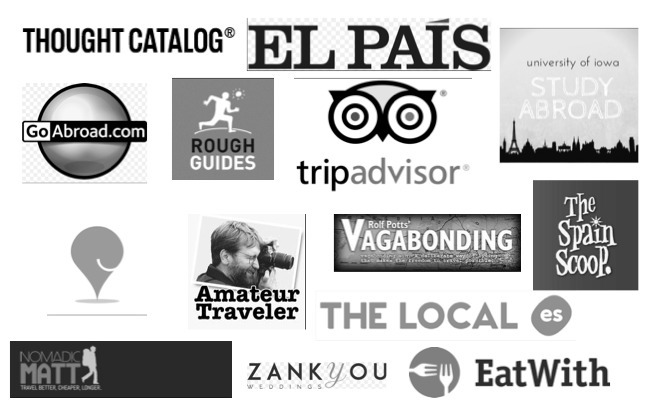 For me, it was more than just a budget thing (as evident by a few terrible places I’ve slept in *cough*Brussels*cough*Santiago de Compostela*) – I wanted to be in the center of the action and have people on-call to suggest tours, eateries and sites. I’ve even taken my step-grandma and the Novio to hostels, and am loyal to chains like Wombat’s. Now in my 30s, hostels for me must have big common areas, wi-fi, security measures and clean facilities, and endless portions at breakfast is a huge plus. And because Seville has so many stately palace homes with rooftops and enormous interior patios, I’m thrilled that the Andalusian capital has finally kicked it up a notch as far as place to siesta while in town. I’ve asked other travelers and friends for their recommendations, as well as where locals send their guests, so this list is legit. You can book with Agoda, a major search engine that recently expanded into Europe and offer up to 30% off the prices you’d see on other sites – I do all of my booking through them nowadays! Simply click on the link for the hostel, then put in your dates and number of guests, or direct yourself to the Agoda box buried at the bottom of the website. I have listed Sunshine and Siestas affiliate links with Agoda, so while you book securely and quickly, you’ll also be helping me keep SandS up and running! It’s of no cost to you, either. 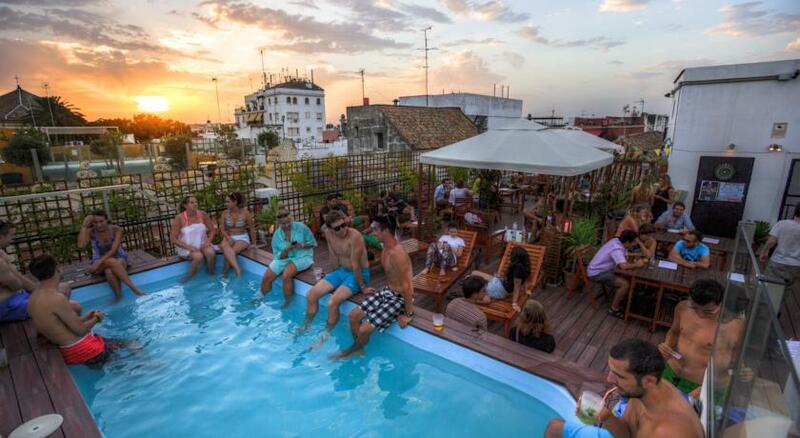 Here are my ten picks for hostels in Seville, listed alphabetically. The Architect, Calle Joaquin Guichot 8 1ª Planta. Centro Neighborhood. When a couple of friends from high school stayed in the Architect in 2012, I was pleased to not only find that my friend María had recently gotten a job there, but that the hostel was sleek and central. While it’s experienced some wear and tear since its opening, expect to be right off of Plaza Nueva and to get good bang for your buck. And even though I love hostels with breakfast included, the Architect no longer provides it. Pop around the corner to Calle Barcelona for old man bars to get your tostada fix. The basics: The Architect has rooms with four, eight or ten beds, including a female-only dorm. You’ll find a common area, plus kitchen and rooftop, plus wi-fi throughout. Each occupant gets a locker, and doors are locked at night. You’ll receive a full refund if you cancel 48 hours or more before your reservation. Price per bed: 16 – 17,50€ in low season; up to 50€ in high season. There are no doubles. Best for: Limited mobility travelers, those looking for comfort without fuss. Boutike, Calle Salles y Ferré, 18. Alfalfa Neighborhood. Boutike takes all of the great stuff about hostels – comfortable common areas, rooftop terrace, killer breakfasts and beautiful design – and morphed it into a gorgeous budget hotel of sorts. Sitting on a quiet street in the Alfalfa neighborhood, Boutike doesn’t have dorm rooms, but rather double rooms with en suite bathrooms, making it a good choice if you’re looking to get some shut eye in a neighborhood known for its nightlife. And there’s more – Boutike also offers complimentary passes to Cuesta Sport fitness center, just a five minute walk from the hostel. You know, to work off the crepes you had for breakfast. The basics: You’ve got everything here – wi-fi, elevators, walking tours and a friendly staff – plus the added amenities of a bar, breakfast and fitness pass. Luggage storage and lockers are also available for free. Price per bed: Standard doubles are 49.50€ per night in low season, Deluxe with balcony 55€. During high season, prices jump to about 120€ nightly. Best for: Families, travelers who crave a bit more quiet, couples. Grand Luxe, Calle Don Remondo, 7. Santa Cruz Neighborhood. Housed in a beautiful, palace-like building, Grand Luxe is all about location. As in, you can see the Giralda peeking out from behind the Archbishop’s Palace from most of the rooms, and the terrace affords magnificent views. And even with the proximity to the beaten tourist path, Grand Luxe offers tours to give you context – and by kayak, bike and foot! 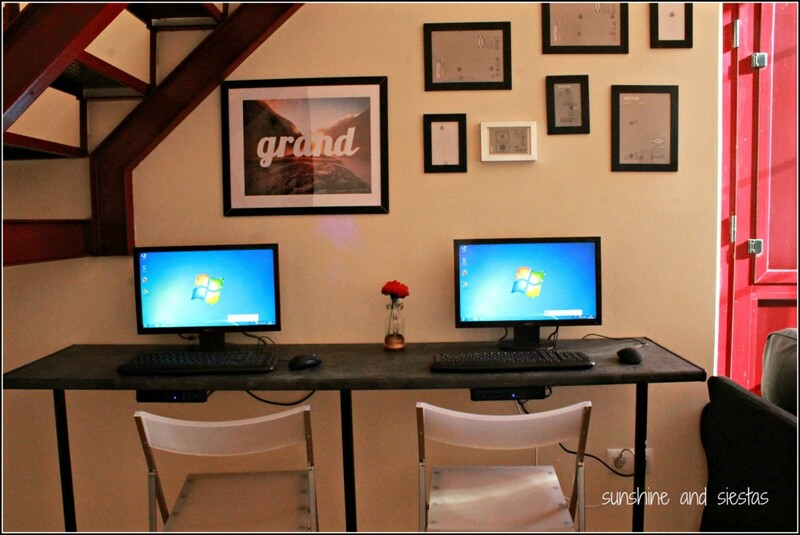 Like all hostels, you’ll find everything you need at Grand Luxe, plus a cozy common room with computers, board games, a huge DVD collection and plenty of like-minded travelers. What stands out here is the price for the location – you can’t beat a modern hostel amongst hotel heavyweights that charge loads for being within earshot to the Cathedral’s bells. The basics: Grand Luxe has several types of rooms, ranging from private doubles to rooms equipped for families and dorm rooms, all with en suite bathrooms. There is also a female-only dorm. A basic breakfast is included (save room for tapas later), along with wi-fi, a stunning terrace and free tours. Security isn’t great here, especially if you have to leave a bag while exploring. 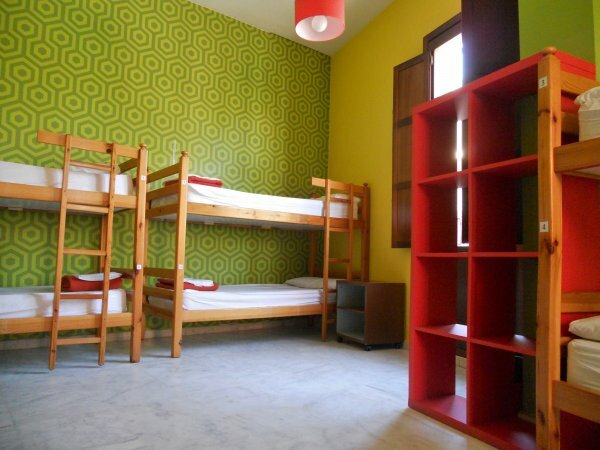 Price per bed: Dorms start at 15€ in low season and go up to 25€ per person in the deluxe double. In high season, expect 35€ and 49.50€, respectively. Best for: travelers wanting to be right next to the tourist sites, solo travelers and even families. Hostel One Centro, Calle Angostillo, 6. Encarnación Neighborhood. While it’s not a new hostel in town, I hear nothing but good things about Hostel One. With an international staff and a national chain backing it up, Hostel One is a perfect blend of camaraderie and privacy thanks to its multitude of rooms available. Be aware that reception is not open from 10pm until 8am and breakfast is not part of the deal, but you can expect the whole hostel package – a bit of noise, a lack of complete privacy in the dorm rooms and a lot of travelers to meet. You’re also closer than most hostels to the trendy Soho Bendita and Calle Regina areas, and the hostel is easy to reach from the airport and train station. The Basics: Hostel One Centro is located in a renovated Sevillian house with a central patio and terrace. Prices are on par with hostels, and group rates are available. Linens, wi-fi and lockers are included in the price; towels and breakfast are not. Price per bed: 16 – 50€ per bed during low season; 60€ for dorm beds up through 100€ for a private single during holidays. I first swooned over La Banda when coming across them on the internet. 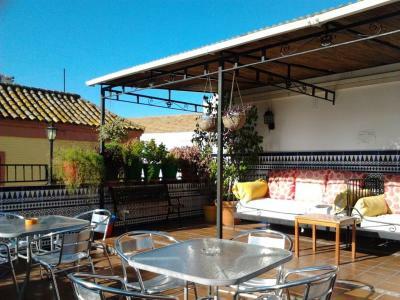 From the story of two brothers who loved to travel and meet people to the sweeping views of the Guadalquivir and the Cathedral, it seemed like everything you could ask for in a hostel. Dorm room bed are kept to a lower number, but there are plenty of common areas and nightly events for solo travelers. The Basics: La Banda features lots of different types of dorms, some with en suite bathrooms. Everything is included in the price – from lockers to linens to cheap lunches on the terrace. And seriously – La Banda has dozens of five-star ratings. Oasis Backpackers, Calle de la Compañía, 1. Centro/Encarnación Neighborhood. I spent the last night of my first year of Spain in an Oasis. It was a fitting end to a magical time in my life, from the tapas crawl with other travelers to the solo breakfast on the terrace as the sun came up over Granada, and I’ve recommended the chain ever since. 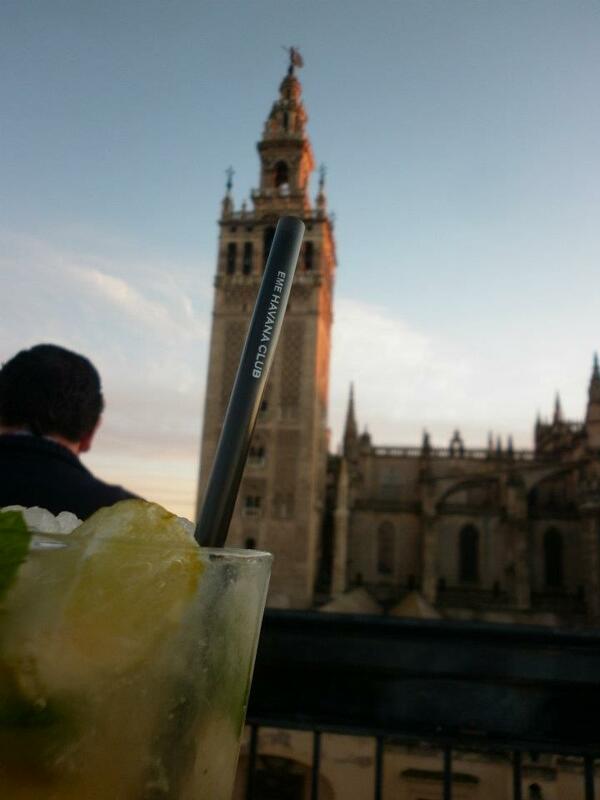 In Seville, Oasis is just off the Plaza de la Encarnación and has been a mainstay for the last dozen years or so. Oasis is great for not just the value, but for the location and the amenities. The atmosphere is young and hip, but you won’t sacrifice quality or security. The Basics: Count on free breakfast and linens, a fun staff and wi-fi in common areas. Note that cancellations with full refunds are not allowed during Holy Week and the April Fair. Price per bed: 17€ a night, off-season and upwards of 40€ during big events. Best for: Solo Travelers, Travelers looking for atmosphere. Samay, Avenida Menéndez Pelayo, 13. Barrio Santa Cruz Neighborhood. A bit further away from the tourist beat, Samay has built a solid reputation amongst travelers and is located on the outer edge of Barrio Santa Cruz. It’s also centrally located to both the bus and train stations and easy to reach on foot or public transportation, making it a good option for a quick stay in town or for those with weird travel times. Samay has en suite bathrooms in most rooms and great common areas, but it’s a no-frills hostel that prides itself on no surprises. 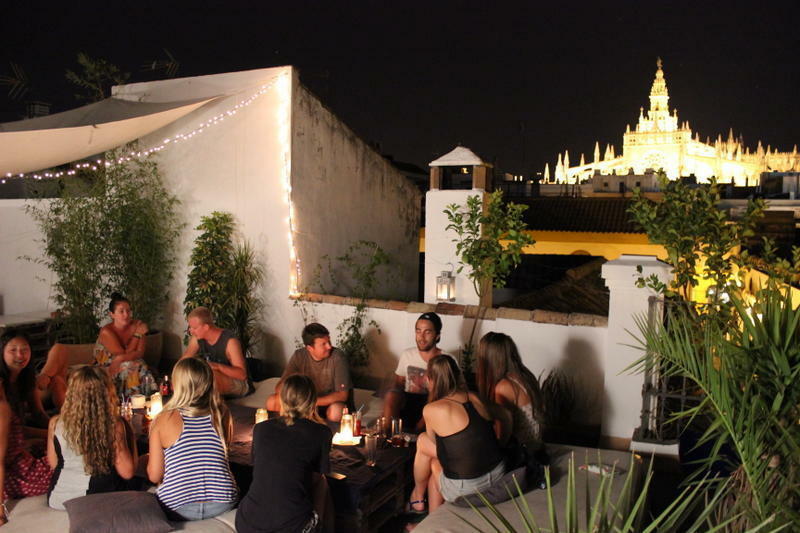 You can simply relax and meet other travelers here. The Basics: Expect 24-hour reception, wi-fi, a big terrace, hot water and linens included. Seriously, there are no surprises here, and friends who have stayed in Samay say it’s comfortable and a basic hostel experience. Wouldn’t you rather spend your time callejando anyway? 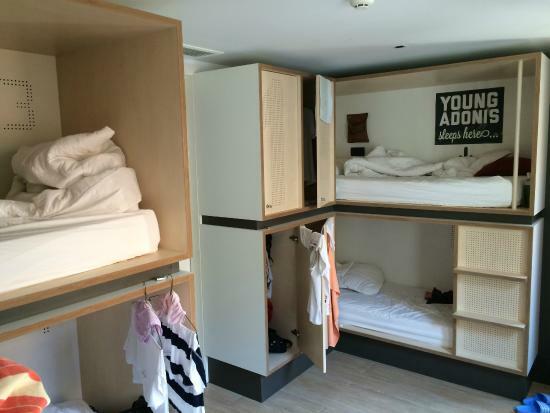 Price per bed: You can’t beat 12€ a night for a dorm room. Prices are set around 30€ during high season and holidays. Sevilla Kitsch, Calle San Gregorio, 1. Centro Neighborhood. I walked by Sevilla Kitsch when taking a short cut between the university and the UNESCO trio of the Alcázar, the Giralda and the Archivo de las Indias. The bright, turquoise shutters and the promise of tacky religious art intrigued me – it’s part hostel, part art gallery and completely new. The Basics: Kitsch is owned by two sevillanas who love art and culture, and the property has plenty of places to eat, drink and tour nearby. Expect dorm rooms (with one six-bed female dorm) and a deluxe room with room for four guests. Breakfast, wi-fi, lockers and a spacious terrace are all included. Oh, and live music is a thing here. TOC is the new kid on the hostel block and draws high review thanks to its location and staff. No detail has been spared in the earthy yet modern hostel – the design is stunning, from the bare wood and natural materials to the fingerprint recognition at the main door. And those pod beds and move theatre! TOC is part of a chain with other hostels in large cities around Spain, and they’re into food, culture and technology, which comes across in their spaces. The basics: Choose dorm or individual suites and relax in what look like beds comfy enough to rival Sir Toby’s (my favorite hostel of all time, located in Prague). Count on a bar, breakfast (that you can pay for ahead of time) and awesome common areas. Even though Triana is one of the most popular districts in the city, it’s not a common place for tourists to stay. 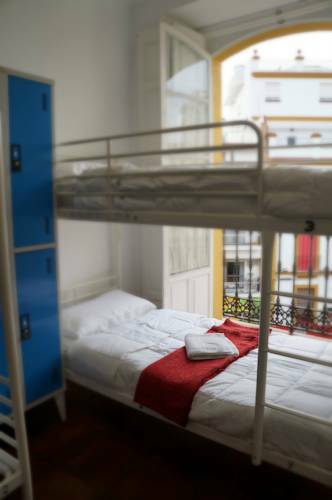 Triana Backpackers is the only budget accommodation in this part of town that also offers special prices for pilgrims on the Camino de Santiago. While it’s not the trendiest hostel, it’s long had a reputation for a fun atmosphere and is just steps from Calle Betis (and, as far from the tourist sites as it seems). And, um, they have jacuzzi. The basics: Like most hostels, a converted home on a quiet street in my favorite neighborhood (it’s only a few block from my house!). 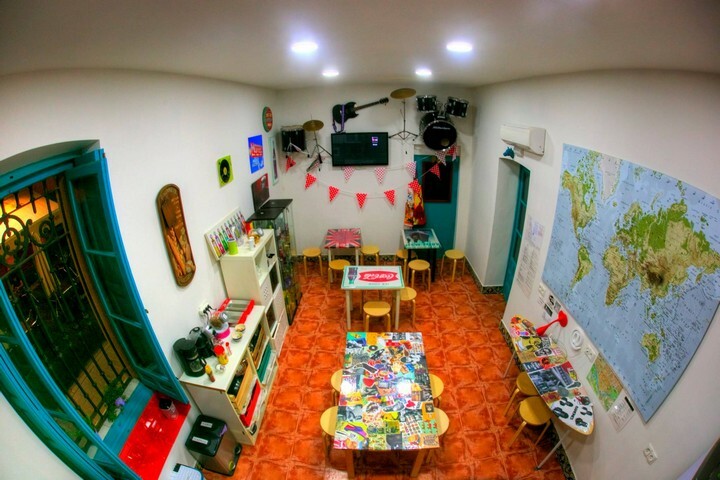 Security is of huge importance at Triana Backpackers – rooms have keycard access like a hotel -, and you’ll likely be rubbing elbows with really budget travelers. Breakfast and linens are included, as is wi-fi and 24-hour reception. Any great hostel experiences you’d care to share? Did I miss any? Or am I way off-base with his post? Let me know in the comments below! If there’s one thing that’s weathering the Spanish economic downturn (no doubt tied to the weather itself), it’s the tourism industry. Accounting for nearly 11% of 2012’2 GDP, Spain constantly pushes the envelope within the tourism industry and has grown to be the second-largest in the world! Where will you be pillow hugging tonight? One aspect that sets Spain apart is its ample offering of accommodation and luxury brands. Iberostar, Melià and Bareclò hotels are considered some of the best brands in the world, and backpackers can find a haven nestled on cobblestone streets or just steps from a private beach. Still, in an ever-changing industry, there’s quite a bit of confusion as to each type of accommodation, and sometimes where to find it at an affordable price (don’t worry, there’s an entrance to a voucher at the end of this explanation!). The view from the rooftop bar at Seville’s Hotel EME. Hotels, like in any country of the world, are plentiful and of varying quality. 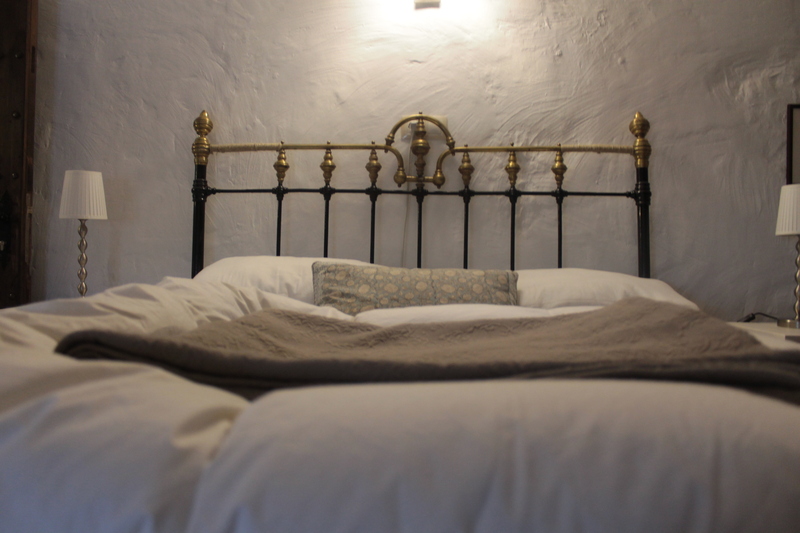 There’s also been a recent surge of new hotels offering boutique accommodation, quirky decor and plenty of character. Spain’s tourism board has instituted a nationwide ranking, using the Q of quality and between 1 and 5 stars. Hotels are marker with a white H and the ranking below. High season is during the summer months, local festivals and Christmas time, so expected steeper prices and less availability. The Spanish government now controls a network of historic buildings converted into luxury hotels, called paradores. From castles to convents, a night in the sumptuous lodging will typically run you more than an average hotel, but booking during the low season can ensure a one-of-a-kind experience in a historically important building. 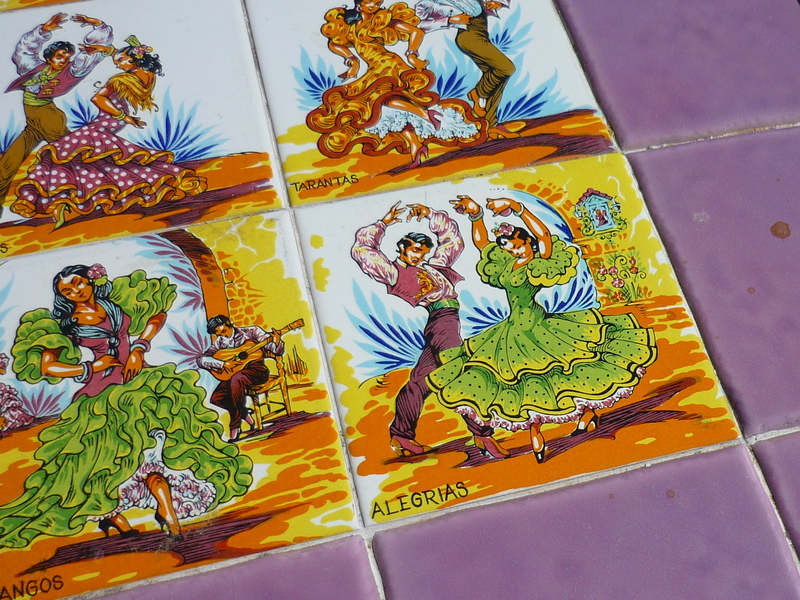 Tiles on the outdoor terrace of the parador in Carmona, Andalusia. Hostels and Albergues are often considered a common type of backpacker accommodation, they are as varied as one could imagine. Typically, they can be found in city centers and offer beds in shared or private accommodation, shared bathrooms and common areas such as living rooms, rooftop terraces or kitchens. Most beds in a shared dorm are less than 20€ a night, making it an ideal place to meet other travelers through free events and walking tours. 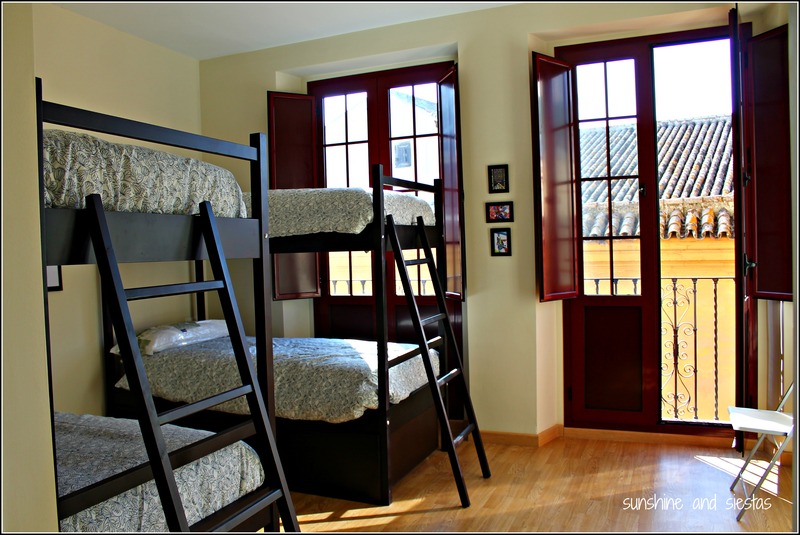 A typical dorm room in hostels. This one is Grand Luxe in Seville. Slightly nicer than hostels, pensions (pensiones) are more budget-friendly than hotels and are typically smaller, too. Most similar to boarding houses, one can expect loads of hospitality and often meals! Thanks to Spain’s varied landscape, rural accommodations are becoming popular, particularly for families wishing to escape city life. Apartment Stays are also becoming a popular way to live like a local in larger cities. Available for days, weeks or months, a piso turístico will allow travelers the privacy of their own space while having access to amenities. Typical rates for a month can be between 500 – 800€, depending on the season. Camping remains a cheap and popular option for staying in Spain, particularly on the coast. Rates are low, even during the summer season, and most offer on-site food and washing facilities. No joke, I spent a night here in the Islas Cies. I’ve been fortunate enough to stay in a tent on the pristine Playa de Rodas in Galicia, an ancient piso in front of the Basilica Santa María del Mar in Barcelona and a friendly pensión within earshot of the tingling churchbells of Santa María la Blanca in Seville. My head has rested in sumptuous hotels from Toledo to Valladolid, as well as old fortresses, which is why I’m excited to present you all with my newest giveaway. I’m teaming up with Your Spain Hostel to offer a giveaway of a 30€ voucher to be used on Your Spain Hostel on any property in any city you’re interested in visiting in Spain. Simply enter by leaving your email address and telling me in the comments where you’d like to travel to in Spain should you win the voucher (extra points if you send a postcard! ), or otherwise! 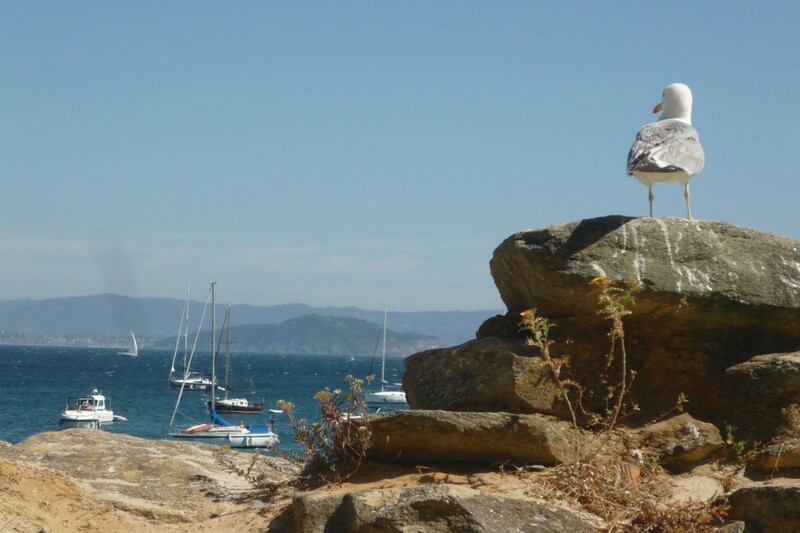 From a bungalow on the beaches of Ibiza to a casa rural in Cangas de Onís, Your Spain Hostel is your one-stop destination for unique and quality accommodation around Spain. The site also provides discounts on tours, entrance to sites, food and even taxi pick-up! You can win extra entries by following both Your Spain Hostel and Sunshine and Siestas on Facebook and Twitter. Happy travels for 2013! 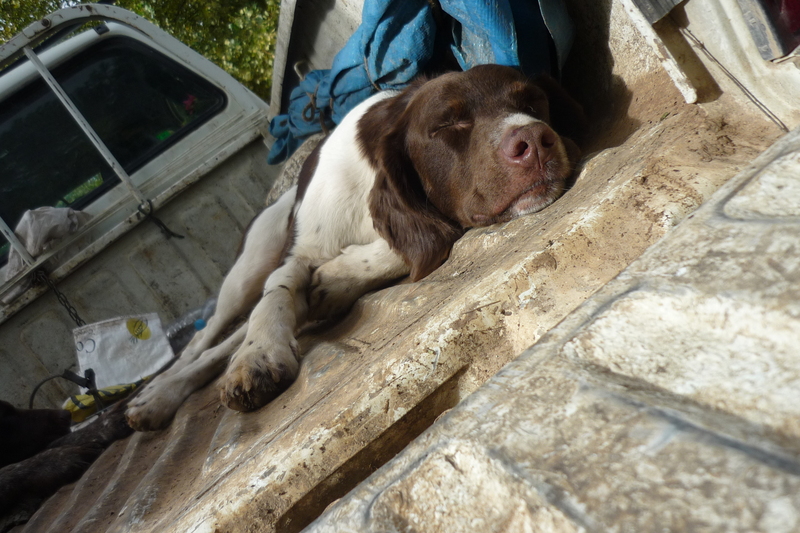 Where are you headed, and where do you like to rest your head at the end of a long day of tourism and tapas? Got any great recs?